Donald E. Super’s career development theory is perhaps the most widely known life-span view of career development. Developmental theories recognize the changes that people go through as they mature, and they emphasize a life-span approach to career choice and adaptation. These theories usually partition working life into stages, and they try to specify the typical vocational behaviors at each stage. In the 1950s, when Super began to formulate his theoretical conceptions, differential psychology and the trait-and-factor theory permeated vocational counseling. The dominant assumption was that differing abilities and interests were crucial in determining occupational choice and success. For this reason, vocational counseling was seen primarily as a process of helping individuals match their abilities and other traits with those required by accessible occupations. By applying the matching model, practitioners of vocational guidance assisted their clients in choosing the “right” vocation, that is, the one that is well matched or congruent with an individual’s abilities, interests, and personality traits. Super recognized the valuable contribution of the trait-and-factor theory and the matching model to vocational theory and guidance practice. But he also believed that they were too static and insufficient in explaining the complexities of vocational behavior. Super proclaimed that occupational choice should be seen as an unfolding process, not a point-in-the-time decision. Therefore, he proceeded to supplement the trait-and-factor approach by constructing a comprehensive career theory in which (a) career development is seen as a lifelong process unfolding in a series of developmental stages and (b) career selection is not a one-shot decision but the cumulative outcome of a series decisions. In his attempts to shape a comprehensive career theory in the 1950s through the mid-1990s, Super complemented the traditional individual-difference approach to vocational guidance with three additional perspectives: (1) developmental perspective focusing on the life course of vocational behavior and stressing continuity in career development, (2) phenomenological perspective emphasizing the role of self-concept in the development of an individual’s career, and (3) contextual perspective bringing forward the importance of multiple social roles and their interaction across the life span. Growth (roughly age 4 to 13), the first life stage, the period when children develop their capacities, attitudes, interests, socialize their needs, and form a general understanding of the world of work. This stage includes four major career developmental tasks: becoming concerned about the future, increasing personal control over one’s own life, convincing oneself to achieve in school and at work, and acquiring competent work habits and attitudes. Exploration (Ages 14-24) is the period when individuals attempt to understand themselves and find their place in the world of work. Through classes, work experience, and hobbies, they try to identify their interests and capabilities and figure out how they fit with various occupations. They make tentative occupational choices and eventually obtain an occupation. This stage involves three career development tasks. 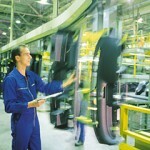 The first one, the crystallization of a career preference, is to develop and plan a tentative vocational goal. The next task, the specification of a career preference, is to convert generalized preferences into a specific choice, a firm vocational goal. The third vocational task is implementation of a career preference by completing appropriate training and securing a position in the chosen occupation. Establishment stage (25-44 years) is the period when the individual, having gained an appropriate position in the chosen field of work, strives to secure the initial position and pursue chances for further advancement. This stage involves three developmental tasks. The first task is stabilizing or securing one place in the organization by adapting to the organization’s requirements and performing job duties satisfactorily. The next task is the consolidation of one’s position by manifesting positive work attitudes and productive habits along with building favorable coworker relations. The third task is to obtain advancement to new levels of responsibility. Maintenance (45-65) is the period of continual adjustment, which includes the career development tasks of holding on, keeping up, and innovating. The individuals strive to maintain what they have achieved, and for this reason they update their competencies and find innovative ways of performing their job routines. They try also to find new challenges, but usually little new ground is broken in this period. Disengagement (over 65) is the final stage, the period of transition out of the workforce. In this stage, individuals encounter the developmental tasks of deceleration, retirement planning, and retirement living. With a declined energy and interest in an occupation, people gradually disengage from their occupational activities and concentrate on retirement planning. In due course, they make a transition to retirement living by facing the challenges of organizing new life patterns. Super’s model demarcates the stages both with age bounds and task markers. Originally, Super viewed the stages as chronological, but later he also acknowledged an age-independent, task-centered view of stages. For example, individuals embarking on a new career in their middle adulthood might go through exploration and establishment stages. Thus the five stages spreading across one’s entire life span, or the “maxicycle,” might also be experienced as “minicycles” within each of the maxicycle stages. Individuals cycle and recycle throughout their life span as they adapt to their own internal changes or to changed opportunities to which they are exposed. Super assumed that not everyone progresses through these stages at fixed ages or in the same manner. This notion led him to develop and elaborate on the construct of career maturity (initially called vocational maturity), which denotes the readiness of the individual to make career decisions. Operationally, it is defined as the extent to which an individual has completed stage-appropriate career developmental tasks in comparison with other people of the same age. Super and his colleagues devoted much effort to define this construct and develop appropriate measures. They identified five primary dimensions of vocational maturity: “planfulness” or awareness of the need to plan ahead, readiness for exploration, informational competence (comprising knowledge about work, occupations, and life career roles), decision-making skills, and reality orientation. Super believed that a young person should be mature enough to benefit from career assessment and counseling. In adults, where recycling through career stages is less dependent on age, Super suggested that readiness for career decision making should be referred to as career adaptability. In his account of vocational behavior, Super incorporated in his developmental perspective the idea that people base their career decision on beliefs about their own abilities and other self-attributes. He saw career choice as the process of implementation of self-concepts, work role as a manifestation of selfhood, and career development as an active process of improving the match between one’s self-concept and the occupational environment. Self-concept can be defined as the way the person sees herself or himself. For example, a young woman might believe that she is bright and creative, self-confident, spontaneous in behavior, and unwilling to assume responsibility. This composite of her beliefs about her own abilities, traits, and values make up her self-concept. Since the self-concept is a subjective phenomenon or an appearance in experience, this perspective is often denoted as phenomenological. Super accepted the view that self-concept is central for understanding a person’s behavior. It is the product of the interaction of a person’s inherited characteristics, neural and endocrine makeup, opportunity to play various roles, and resulting outcomes of role-playing success. Formation of self-concept begins in infancy when a sense of identity is developed. As they grow, individuals develop a personal image of their own abilities, personality traits, values, and roles. They then compare this subjective picture of themselves with what they get to know about the world’s occupations, and they then try to translate their self-concept into an occupational perspective. The outcome is the occupational self-concept, defined by Super as a constellation of self-attributes that are vocationally relevant for the individual. The occupational self-concept eventually may transform into a vocational preference. Super believed that the career development process can be guided, among others, by aiding subjects to develop and accept their occupational self-concepts. Thus the process of career choosing and development is basically that of developing and implementing a self-concept. The degree of satisfaction people attain from the work role is, according to Super, proportional to the degree to which they have been successful in their endeavor to implement self-concepts. This endeavor, however, requires a continuous personal adjustment; self-concepts develop and change throughout people’s lives as does also their living and working environments. This makes the career choice and adjustment a continuous process. The third segment of Super’s theory brings forward a contextual perspective, that is, the view of career development in the context of all life roles enacted by an individual. The work role, albeit of central importance for many people in our culture, is only one among many life roles that an individual occupies in his or her life. None of the roles can be properly understood without taking into account the whole constellation of roles. Already in his early theoretical writings, Super referred to work as a way of life and noted that satisfactory vocational adjustment is possible only when both the nature of work and the way of life complement an individual’s aptitudes, interests, and values. However, this interdependency of various spheres of life is more completely addressed in Supers’ later writings, when he developed his life-span, life-space view to career development and portrayed it graphically in his popular Life-Career Rainbow. Super conceives life space as a constellation of social functions arranged in a pattern of core and peripheral roles. People play a variety of roles during their life. Some of them begin early in the life course (e.g., that of child), others later (e.g., that of student), or still later (e.g., that of pensioner). At some life stages, a number of simultaneous roles (e.g., that of worker, spouse, homemaker, parent, and citizen) may constitute an individual’s life structure. However, usually two or three roles are salient or relatively more important than others. The salient life roles constitute the core of a person; they are fundamental for the person’s identity and essential for life satisfaction. The fact that people play several simultaneous roles means that roles interact and impact one another. The interaction among the roles can be supportive, supplementary, compensatory, or neutral. It can also be conflicting if some of the roles absorb too much of the available time and energy. As a matter of fact, for most people the interpenetration of different spheres of life is inevitable in some life stages. 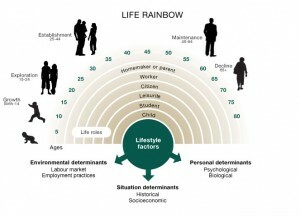 By combining the life space with the life-span or developmental perspective, the Rainbow model shows how the role constellation changes with life stages. As Super noted, life roles wax and wane over time. This simple account was indeed needed to clearly emphasize an all-too-often forgotten point—that peoples’ careers cannot be understood outside of their social context. To fully understand an individual’s career, it is necessary to explore the whole web of his or her life roles. After all, according to a more recent view of Super’s, it is the constellation of role interactions that constitutes the career. Perhaps the most important single idea of Super was his tenet that occupational choice should be seen as an unfolding process. Interestingly enough, his theory building was also an unfolding process; he continued to augment and refine his theory throughout his life. Thus his theory also evolved through various stages that can be traced in their name modifications: from the original Career Development Theory to Developmental Self-Concept Theory, and then to the currently prevailing Life-Span, Life-Space Theory. Super incorporated the ideas of many predecessors in his attempt to compile an integrative body of knowledge that comprises various perspectives on career development. The result was a comprehensive but also fragmental theoretical account. Super himself admitted that disparate segments of his theory need to be cemented together more thoroughly. He hoped that this task will be eventually accomplished by future theorists. However, in spite of his reluctance to present a more parsimonious and coherent theoretical statement, his theorizing was most appealing. Together with his followers, he has had, and continues to have, a major impact upon career development research and counseling. Super, D. E. 1953. “Career Patterns as a Basis for Vocational Counseling.” Journal of Counseling Psychology 1:12-20. Super, D. E. 1953. “A Theory of Vocational Development.” American Psychologist 8:185-190. Super, D. E. 1957. The Psychology of Careers. New York: Harper& Row. Super, D. E. 1963. “Self-concepts in Vocational Development.” Pp. 1-16 in Career Development: Self-concept Theory, edited by D. E. Super, R. Starishevski, N. Matlin, and J. P. Jordaan. New York: College Entrance Examination Board. Super, D. E. 1963. “Toward Making Self-concept Theory Operational.” Pp. 17-31 in Career Development: Self-concept Theory, edited by D. E. Super, R. Starishevski, N. Matlin, and J. P. Jordaan. New York: College Entrance Examination Board. Super, D. E. 1964. “A Developmental Approach to Vocational Guidance: Recent Theory and Results.” Vocational Guidance Quarterly 13:1-10. Super, D. E. 1980. “A Life-span, Life-space Approach to Career Development.” Journal of Vocational Behavior 16:282-298. Super, D. E., Crites, J. O., Hummel, R. C., Moser, H. P., Overstreet, P. L. and Warnath, C. F. 1957. Vocational Development: A Framework for Research. New York: Bureau of Publications, Teachers College, Columbia University. Super, D. E., Savickas, M. L. and Super, C. M. 1996. “The Life-span, Life-space Approach to Careers.” Pp. 121-178 in Career Choice and Development. 3d ed., edited by D. Brown, L. Brooks, and Associates. San Francisco, CA: Jossey-Bass.